The iron powder high-pressure ball press is a type of product newly developed according to the collection and reuse of metallurgical dust. 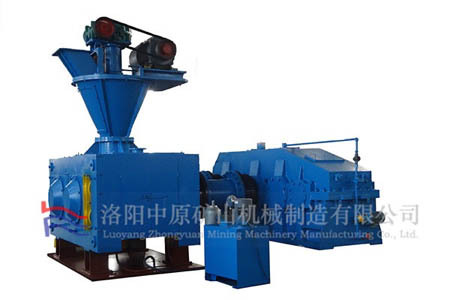 This machine can mainly suppress various iron powder, mineral powder, iron oxide scale, steel slag and so on. In the past, most of the powder in the metallurgical industry was abandoned or changed to other uses, resulting in a great waste of resources. With the increasingly tight resources and energy, the utilization of powder in the metallurgical industry has received more and more attention. 1. The material particle size shall be 90-260 mesh. 2. High hardness impurities are not allowed in the material. Otherwise, the surface of the roller shell will be damaged. 3. The feeding of the ball press machine must be uniform and timely, and a screw feeder with adjustable speed should be adopted. 4. Observe the amount of material returned by the ball press and adjust the supply of new materials. This ball press is widely used in refractory, power plant, metallurgy, chemical, energy, transportation, heating and other industries. The final briquettes pressed by iron powder ball machine is energy-saving and environmentally friendly, easy to transport, improves the utilization of waste, and with good economic and social benefits.